THERE IS MUCH MORE TO EAT THAN JUST MILK. Sooner or later your baby will grow its first teeth. And of course those teeth want to bite on something. This is the time when parents definitely switch to baby food and more solid food if they haven't done so already. It also marks the beginning of daily care of those milk teeth so they can remain free of tooth decay. It is also a time to start seeing your dentist regularly with your child. Our dental artists care a lot about your child's first teeth. They are valuable placeholders for the set of permanent teeth that will show up later and if they are taken care of well you will prevent misalignments that may be quite expensive later on. Milk teeth are important for good digestion through biting and grinding food, but they also play an important part in language development and the appearance of your child's face. 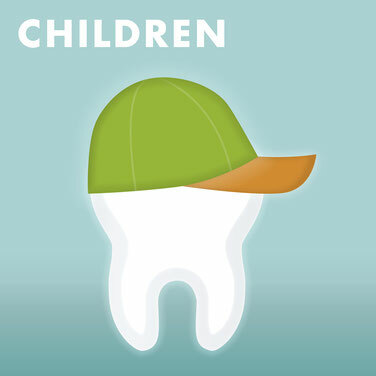 So, teeth are an essential aspect of a healthy emotional and physical development of your child. important to prevent tooth decay and gingival infections in your child's mouth. We will show you and your little ones exactly how to brush their teeth properly, which toothpaste and brush are suitable for this and if your child should take fluoride tablets as a protection of the enamel of milk teeth that is less mineralized or if the fluorides should be applied as a protective coating directly on the child's teeth. Dental fear is something that has been learned. Caregivers may be imitated or children have had painful first experiences, maybe because of a drill. But if the first few visits to the dentist only serve as check-ups and instruction about keeping teeth healthy, your children will learn fast that there is no reason to be afraid of their dentist.